While the program was billed as an “international high level ministerial conference,” there were few in attendance – rather disappointing given UNEP’s intent in organizing the event (to develop a productive plan of action) as well as the importance of the topics addressed. This is one of the shortcomings of so many of these meetings – the absence of high-level decision-makers, many of whom lack the information necessary to make sound policy decisions. Whether it is a UNEP program or one organized by other sectors of civil society, greater effort has to be made to ensure that the people who need to attend such meetings actually appear. Where information is available, it is no excuse that the right person was unavailable to receive it. UNEP has promised to post these recommendations, as well as the ministerial Bangkok Plan of Action, shortly, and I will update this post as soon as that occurs. According to the Bangkok Post, 25 nations so far have endorsed the Bangkok Plan of Action. Nonetheless, neither the Plan of Action nor the recommendations can be interpreted as binding on UNEP or nations. The aspirational language of the documents (e.g., Governments “should”), coupled with the relatively small turnout of high-level government officials at the conference, effectively proscribes such construction. Moreover, such Plans tend to highlight needs and goals generically rather than actual, substantive programs describing how the needs will be addressed and the goals met. Unless elevated to the UN General Assembly or, better yet, in the context of an international convention, the normative value of these documents is merely instructive. Notwithstanding, there is value in the Plan and recommendations to the extent that they provide decent guidelines for IGOs, NGOs, water commissions, and others by which to structure water management programs. Additionally, the formulation of the recommendations served as a wonderful basis for stimulating dialogue and exchange, as well as strengthening existing ties and establishing new connections. While this is probably most true among the NGO representatives in attendance (who tend to have a refreshing idealism), there seemed to be considerable interaction among all of the participants. While UNEP programs have not always served as models of success, and while this particular meeting could be critiqued for what it was not, there is much about which to be optimist. One other noteworthy outcome of the conference is the public release of UNEPs third report on Freshwater Under Threat in Asia, which focused on South Asia and highlights three major river basins in the region: the Ganges-Brahmaputra-Meghna, the Indus and the Helmand. The prior two reports focused on South East Asia, and North East Asia. As for my presence at the conference, I attended as a representative of UNESCO’s International Hydrological Programme to help represent its ongoing efforts on transboundary aquifers. In particular, UNESCO-IHP has been instrumental to the UN International Law Commission in its work articulating and developing international law for transboundary ground water resources. That effort recently culminated in the UN General Assembly commending the work product of the UNILC – the Law of Transboundary Aquifers – to the Member States and the addition of the topic to the its agenda in 2011. I had the honor of serving on the experts group organized by UNESCO-IHP that assisted the UNILC Special Rapporteur, Ambassador Chusei Yamada, in this effort. I have highlighted above some important language related to transboundary aquifers, as well as UNESCO’s efforts, that appear in the Plan of Action and recommendations. The Greek paper, Kathimerini, reports that the water situation on the Euphrates and Tigris Rivers is getting worse. Iraqi dam storage is down 75% from 3 years ago, while the river flow in Euphrates has fallen by a similar percentage as compared with the year 2000. And since rainfall in the region has been average, all finger’s point to Turkey and its ongoing hydro projects. Turkey is the upper riparian on both the Tigris and Euphrates Rivers, which flow from Turkey’s eastern mountains down through Syria and into Iraq. The two rivers eventually join in southern Iraq to form the Shat al Arab before entering the Persian Gulf. Both Syria and Iraq, downstream riparians, have complained that Turkey’s GAP activities and the downstream impacts violate international law. The statistics presented in this article give their complaints credence. The difficulty is that Turkey doesn’t seem to care. The country has long championed an absolutist international law perspective – absolute territorial sovereignty – that posits that sovereignty entitles states to unrestrained use of resources found within their territo­ries. They claim that since the majority of water originates within their territory (more than 95% for the Euphrates and some 43% of the Tigris), they should have the right to use it for their benefit. This position is also seen in Turkey’s observance of (or lack thereof) the solitary bilateral water sharing agreement between Turkey and Iraq. Under the 1946 Treaty of Friendship, Turkey is obliged to inform Iraq of any projects it undertakes that are likely to affect the flow of the rivers. Turkey, however, has argued that its activities will only serve to improve water flow in the two rivers and has discounted evidence to the contrary. Turkey was one of three nations (China and Burundi were the other two) that voted against the 1997 UN Watercourses Convention in the UN General Assembly. That instrument stands for the principle of limited territorial sovereignty and obligates states to an equitable and reasonable use of a transboundary watercourse as well as to ensure that activities within their territory do not cause significant harm to other riparian states. Both Iraq and Syria have ratified or acceded to that instrument. That the Convention has yet to go into force (see the Status of the Convention here and my recent post on the subject) is irrelevant as most of its provisions have the status of customary international law. Yet, Turkey continues to espouse its absolutist position. The principal shortcoming of Turkey’s approach is that it is nearly alone in its championing of this approach, one that was discarded long ago by the vast majority of nations. China is the only other nation that I know of that continues to actively assert this position (primarily in relation to the Mekong River). Practically speaking, this absolutist approach disregards downstream consequences and the rights of downstream states to the use of the two rivers. As Turkey is nearly exclusively an upstream state in all of its transboundary rivers, it has not experienced life as a downstream riparian. I suspect that if Turkey had an opportunity to be reliant on an upstream state’s goodwill and good faith, it too would change its perspective (the US so did when it repudiated the Harmon Doctrine in its relations with Mexico when it later negotiated transboundary waters agreements with Canada; but that is a discussion for another time). Possibly, Turkey will eventually find itself reliant on the goodwill and good faith of Syria and Iraq on other issues important to its interests, though, at the moment, I can’t think of any that could be used to counterweigh the water issue. It is more likely that Turkey will find itself reliant on the goodwill and good faith of other nations who might be sympathetic to the plight of Turkey’s downstream neighbors. Membership in the European Union – something Turkey may covet more than the waters of the Tigris and Euphrates – has often been suggested as the likely carrot for Turkey’s cooperation with Syria and Iraq. That, however, presupposes that the EU truly is interested in this dilemma. Given most of Europe’s disdain for the US’s activities in Iraq, there could be a leadership opportunity in the Middle East for the sidelined Europeans. Does Europe have the tenacity and determination to take on this challenge? If not, Iraq and Syria are in for a very long drought. Thanks to Rich Rapier for sending me the link to the Greek article. According to the Boston Herald and The Jordan Times, Jordan will pursue the long-talked about canal project between the Red Sea and the Dead Sea without Israel. According to news reports, Jordan declared its intention this past Sunday at the 2009 World Economic Forum in the Middle East, held at the Dead Sea in Jordan. The original plan had called for Jordan to cooperate with Israel on the canal and the World Bank was in the midst of assessing the feasibility of the joint project. Now that Jordan has decided to go it alone, it has dubbed its project “Jordan National Red Sea Water Development Project” in order to differentiate it from the original “Red-Dead Canal” proposal. The purpose behind the project is two-fold. The first is to provide desalinated water to one of the most parched regions of the world. Red Sea water will be channeled through pipelines to a desalination facility that, using the elevation difference between the Red Sea (at sea level) and the Dead Sea (approximately 400 meters below sea level), is expected to provide 120 mcm of fresh water annually by 2014, and eventually at full capacity, as much as 700 mcm. The second rationale for the project is to revive the “dying” Dead Sea, which over the past 20 or 30 years, has lost about one-third of its area and dropped more than 30 meters. The Sea has been desiccated for the same reasons that the Aral Sea has been drying out (see my prior post on the Aral Sea) – because of Israeli and Jordanian upstream diversions from the Jordan River (the Dead Sea’s principle source of water) that have reduced the river’s inflow to as little as five percent of natural historical natural flows (check out the website and Photo Album of Friends of the Earth Middle East on the Dead Sea). The idea is to take the salts removed in the desalination process and pump them back into the remaining waters used to fill the heavily saline Dead Sea (10 times the salinity of sea water). That Jordan is going it alone may not be much of a surprise. Jordan has been frustrated with environmentalists in Israel who have long challenged the plan as an environmentally destructive plan. They cite the different chemistries of Red Sea and Dead Sea water and the potential alteration of the chemical makeup that makes the Dead Sea so distinctive as well as the possible impact on currents in the Red Sea that could threaten the Red Sea’s unique coral life (see, for example, the campaign of Friends of the Earth Middle East). Without the obstacles of the Israeli environmentalists, Jordan, which only has a nascent environmental movement, can move forward at its own whim. Of course, a critical question will be whether Jordan can secure the necessary funds for the project, which is expected to cost around $5-$10 billion and to take 30 years to complete. Without Israel and in the context of a peace initiative (some have dubbed the original Red-Dead Canal project as the “Peace Canal”), that may be difficult. But that may be part of Jordan’s strategy to overcome the environmental opposition and pressure Israel to commit to the plan. And Jordan’s tactic may be working. Not long after Jordan’s announced its intentions to move forward with its own plan, Israel’s Water Authority expressed its hope that a cooperative arrangement could yet be achieved. And Israel certainly has good reasons to want to take part in this project – while the majority of the benefits from a Red-Dead canal will accrue to Jordan, Israel would still benefit considerably from fresh water in its Arava Valley, as well as a revived Dead Sea. According to the news reports, Jordan does not intend its new canal to replace the Red-Dead Canal Project. Would that allow for the possibility of two canals? Highly unlikely. On 22 April 2009, Tunisia became the 17th nation to ratify the UN Convention on the Non-navigational Uses of International Watercourses. The Convention represents the UN’s effort to codify customary international law for transboundary fresh water resources. It was adopted by the UN General Assembly in 1997 by a vote of 103 in favor, 27 abstentions, and 3 against, with 33 Members absent (see my analysis of the vote here). Tunisia’s ratification is likely due, in part, to the efforts of the World Wildlife Fund, which in recent years, has embarked on an effort to convince countries to sign on to the Watercourse Convention. While Tunisia’s ratification is certainly a laudatory and welcomed development, the tally of Convention 17 ratifications is still shy of the 35 ratifications needed to bring the instrument into force (you can find the status of the Convention here). However, the real value of the Convention is not in its possible ratification at some future date. Rather, it is in the development of local and regional agreements that follow the general principles articulated in the Convention. The Watercourse Convention was designed to serve as a framework for more specific bilateral and regional agreements relating to the use, management and preservation of transboundary water resources. Additionally, it was intended to help prevent and resolve conflicts over international water resources, and to promote sustainable development and the protection of global water supplies. Even before its adoption by the General Assembly, its draft (formulated by the UN International Law Commission) had already influenced the drafting of local and regional arrangements including the 1992 UN/ECE Convention on the Protection and Use of Transboundary Watercourses and International Lakes, the 1995 SADC Protocol on Shared Watercourse Systems (revised in 2000), the 1995 Agreement on the Cooperation for the Sustainable Development of the Mekong River Basin, and the 1991 Protocol on Common Water Resources concluded between Argentina and Chile. It also seems to have had considerable weight in the development of 1999 Draft Protocol to the above-noted 1992 UN/ECE Watercourses/Lakes Convention and was referred to by the International Court of Justice in the Gabcíkovo-Nagymaros case where the Court affirming the centrality of the principle of equitable and reasonable utilization. While I certainly applaud Tunisia’s ratification and the efforts of WWF, I would much prefer to see greater efforts made at developing agreements among basin riparians. Currently, of the 263 international river and lake basins found on Earth, 153 (nearly 60%) still lack an agreement. Moreover, of the 106 basins that have more than 2 riparians and that have an agreement, only 20% of those agreements involve more than 2 of the riparians. Clearly, this is woefully short of what is needed. As for transboundary ground waters, the situation is more dire. Presently, there is only one agreement over a transboundary aquifer (between France and Switzerland over the Genevese Aquifer) and two data sharing arrangements in northern Africa (on the Nubian Sandstone Aquifer and on the Western Sahara Aquifer). In contrast, a recent study prepared under UNESCO’s and IAH’s ISARM (Internationally Shared Aquifer Resources Management) Initiative, indicates that there are at least 273 transboundary aquifers worldwide. Given current water stress and scarcity in many parts of the world, as well as the growing peril from climate change, which threatens to worsen water availability worldwide, the need for cooperation and coordination over shared water resources is greater than it has ever been. While a framework global instrument can provide the guidelines by which to manage transboundary waters, it will be the local and regional agreements that achieve real success in the challenge to secure all peoples and all nations adequate fresh water. 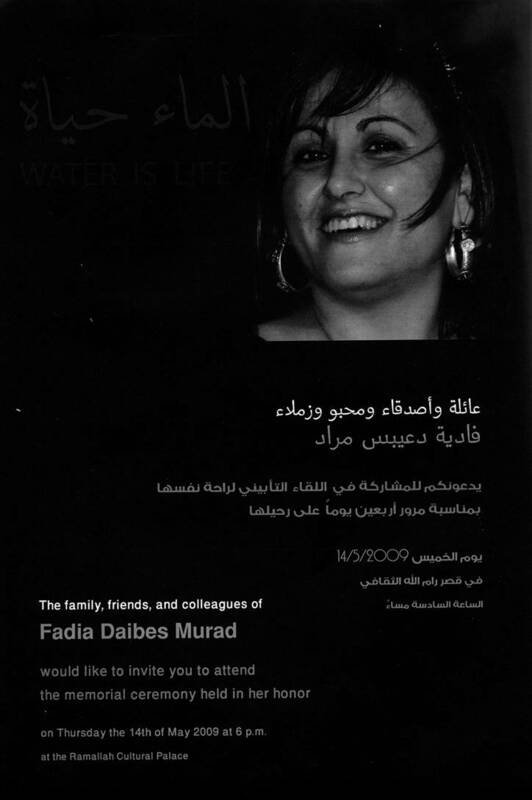 A few days ago, friends and colleagues commemorated the life of Fadia Daibes Murad, a Palestinian water law and policy expert who died in a car crash on her way back to Ramallah from the World Water Forum in Istanbul, Turkey. Fadia had long been an advocate for Palestinian water rights in the difficult contest between Palestinians and Israelis. She had also been a stalwart voice on women’s issues and was widely known as an intelligent and articulate champion of human rights. While I had heard about Fadia previously, I got to know her during our participation in Track II negotiations over water issues between Palestinians and Israelis under the framework of the Geneva Initiative. During that process, I found Fadia to be wonderfully energetic and approachable, someone with whom you could argue intelligently and not get caught up in idealism. While Fadia certainly held strong opinions about the Palestinian rights, water allocations, and related issues, she could also recognize and acknowledge opposing positions. Most important, she had a wonderful personality that welcomed conversation and that made everyone feel at ease. I do not know what influence Fadia had on the Palestinian side. But from my discussions with some Israelis, I know that she found respect on that side. And that is the essence of the ongoing dispute – a loss of respect and trust that will keep peace at bay so long as both parties ignore each other’s human dignity and fail to recognize each other’s rights. I can only hope that for the sake of peace, the Palestinians and the Israelis have someone to fill her shoes. I was not able to attend Fadia’s memorial, but her memory remains with me. Fadia’s untimely death is a tremendous loss to her family and friends. It is also a loss to those devoted to the cause of peace in the Middle East. Her absence will be sorely missed. · Interview at the World Water Forum in Istanbul where Fadia represented the Gender and Water Alliance on the topic of water and conflict from a gender perspective. · Statement of Dr. Fadia Daibes Murad at 5th World Water Forum. For those of you who will be in the Portland, Oregon, area on June 1, I have been asked to give a lecture to the Jewish Federation of Greater Portland on Scarcity, Conflict, & Security: The Future of Water for Israel & Her Neighbors. The lecture will take place at the Benson Hotel, located at 309 SW Broadway in Portland, OR, 12noon to 1:30 pm. There is a $20 admission fee (unfortunately, I have no control over this). You can find a flyer about the program here and register for the program here. Yes, this lecture was originally scheduled for May 19. However, I was just invited to serve on a UNESCO IHP delegation to a UNEP Conference on “Strengthening Transboundary Freshwater Governance – The Environmental Sustainability Challenge” to be held in Bangkok, Thailand. The Jewish Federation was very gracious about rescheduling my talk. In the interests of full disclosure, while I have lived in the United States for more than 30 years, I was born and initially raised in Israel. You are currently browsing the International Water Law Project Blog blog archives for May, 2009.